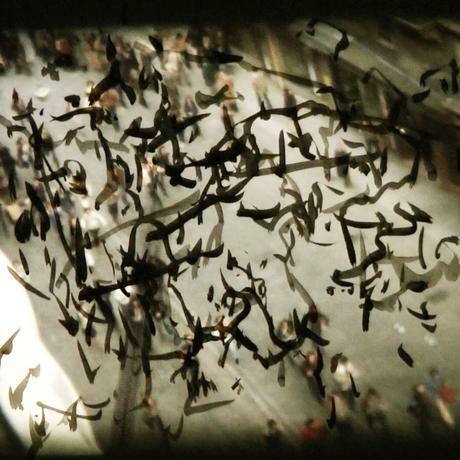 On the 25th October Nosadella Due and Atelier Si hosted Data capture_In search of… an exhibition of work produced during my month long residency. 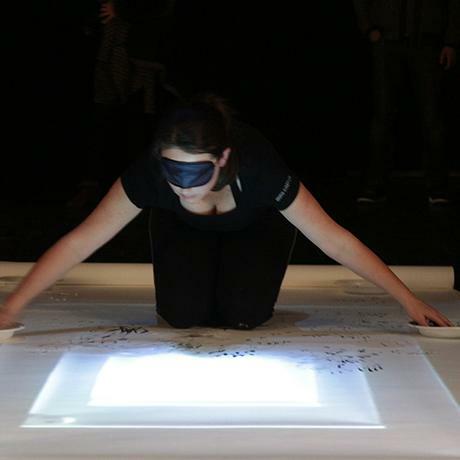 The first two parts of the exhibition are performances developed in response to my experiences in Bologna. One of my first impressions of Bologna was of public protest in the streets. The protests continued at intervals during my residency. One of the marches I documented involved citizens who were protesting the forced removals of immigrants from squatted housing in the city. Then the student protests flared up in South Africa in the #FeesMustFall campaign. I followed and sourced footage from the protests at the university of Cape Town where I teach part-time. 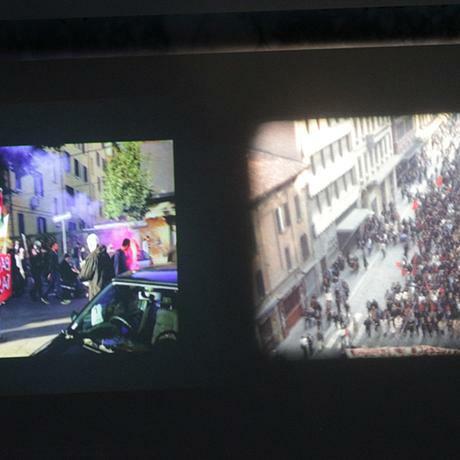 I edited the source material together and projected the digital video next to a film projection of archival super 8 footage of a student protest in the late 1970’s in Bologna. The archival footage was sourced from Home Movies, an organization that is collecting, archiving and digitizing home movies from families in Bologna. 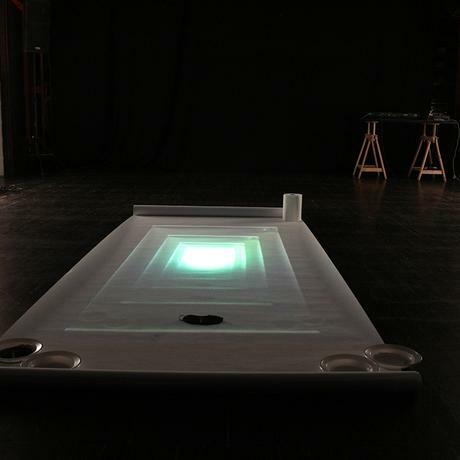 My performance was linked to a festival program they were running for the month of October to December titled Archivio Aperto,. 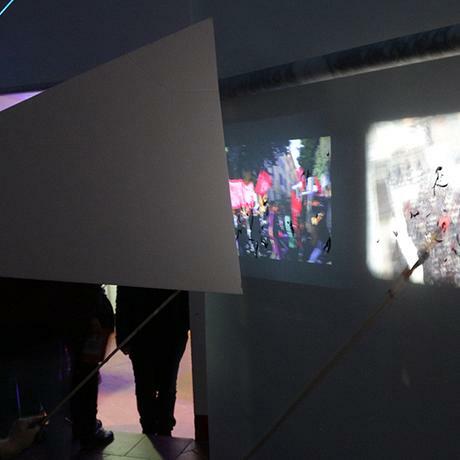 The digital and film footage were rear projected side by side onto a double layer of paper and drafting film. 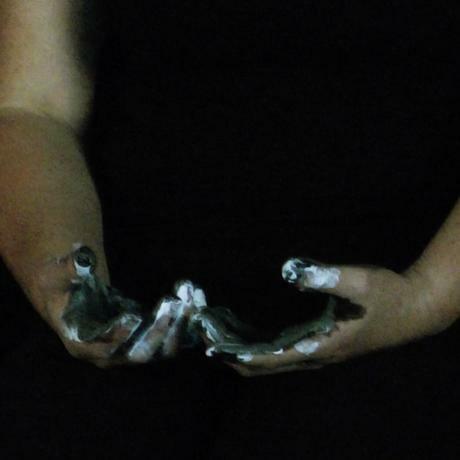 Wearing a mask that I created to split my vision (only allowing my left eye to see the digital footage and my right eye the film footage) I attempted to paint the moving images in black ink. Having no depth perception and the impossible task of drawing two different images simultaneously handicaps me. 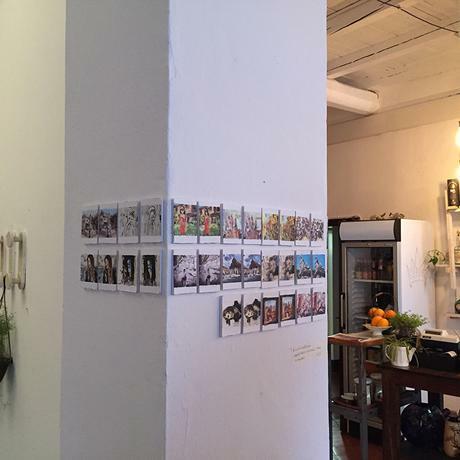 The experience is one of visual overload and conflating the two cities of Cape Town and Bologna in time and space. 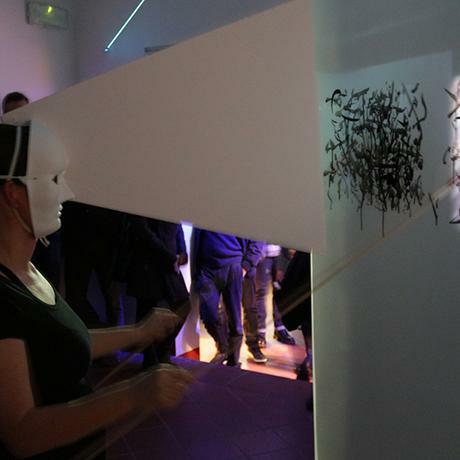 This performance was set up in a small space called Il Nulle (The Nothing) adjacent to the main theatre. The second performance took place in the theatre. 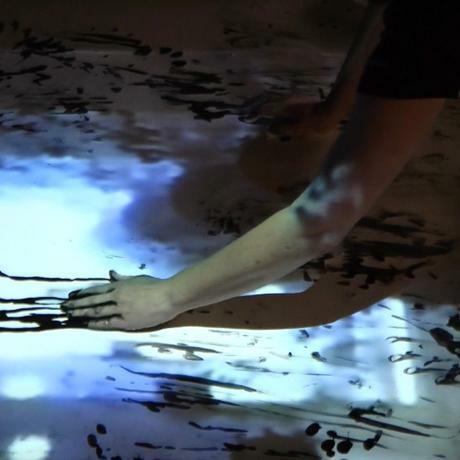 Here, in contrast to the first performance, I wanted to create a space of introspection and reflection on the video media itself. 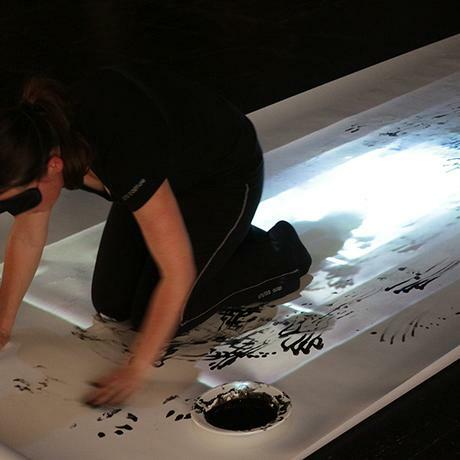 I worked blindfolded painting with my hands (one hand in black, the other white paint) onto a large roll of paper on the floor. 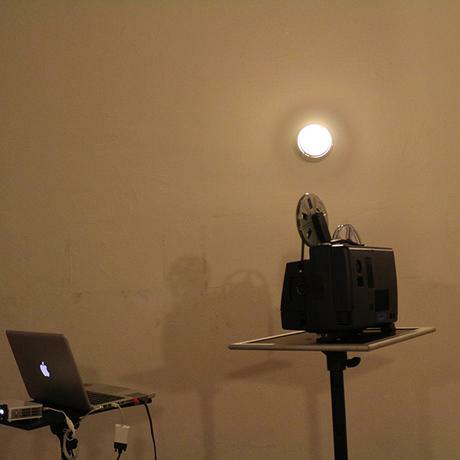 A video loop was set up using a camera and projector rigged to the ceiling scaffolding in the theatre. 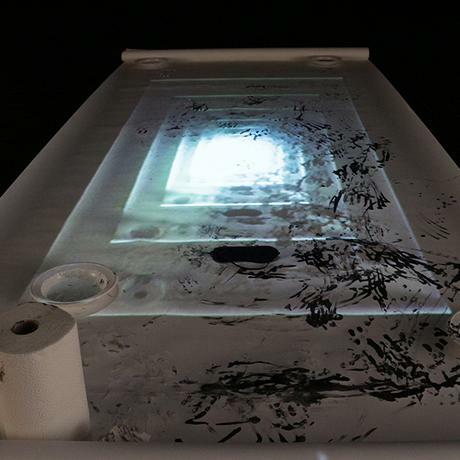 This created a video loop (similar to when you place two mirrors facing each other) of my movements on the paper, smaller and smaller disappearing into the light. Here the focus was on an ascending and descending movement, back and forth, inside and out. 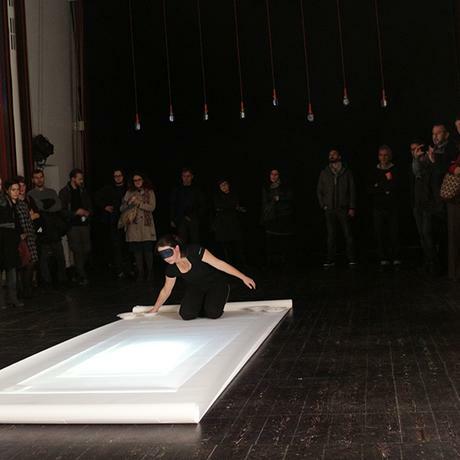 The performance was inspired by my walk through the longest arcade of porticos (666 arches) up to San Luca on a hill outside the historical center of Bologna. 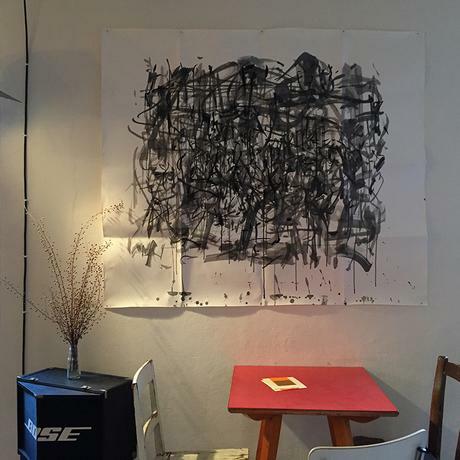 The third part to my exhibition was on display in the upstairs cafeteria at Atelier Si. 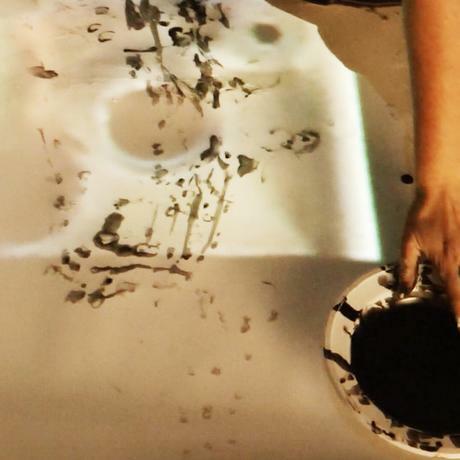 There we presented three series of paintings created in Cape Town before I took up my residency at Nosadella Due. 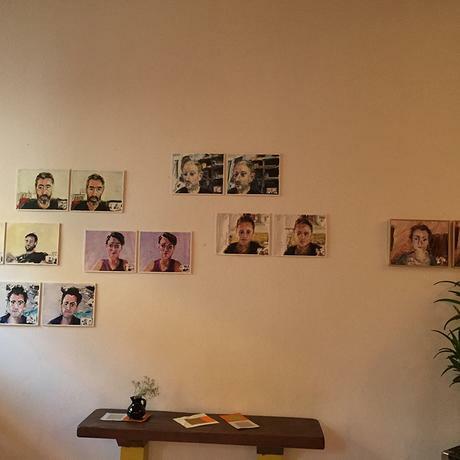 #Inter- face is a series of ambidextrous portraits painted from Skype video chats with people at Nosadella Due residency and Atelier Si. The other two series are titled under #insearchofBologna and comprise of ambidextrous paintings from live webcams feeds of Bologna and from Instagram photos sourced from searching for top posts for #bologna. The Instagram paintings I then photographed and posted again onto Instagram tagging the source image. I created further paintings from some of the ‘likes’ to find more images of bologna to paint and re-post. 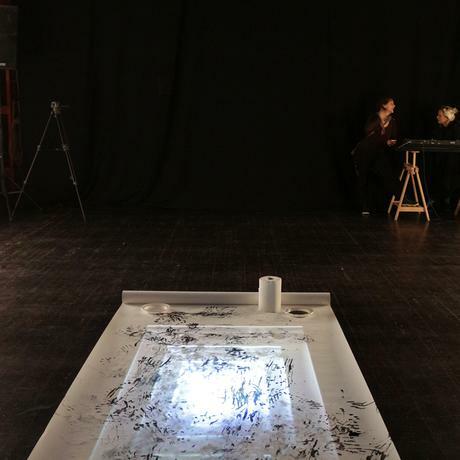 Lastly I created a large ink drawing from projecting archival footage sourced from Youtube of Guglielmo Marconi’s funeral in Bologna in 1937. 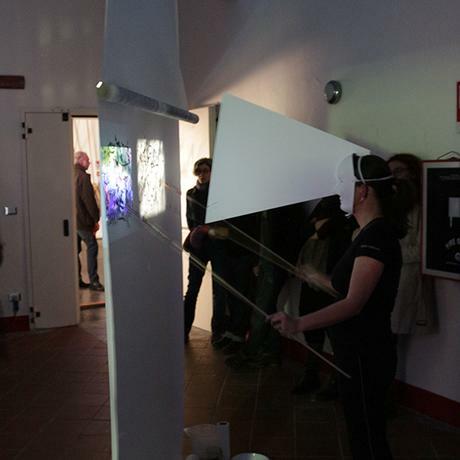 The aim of these works was to explore Bologna through online media at a distance and prior to my firsthand experience of the city. 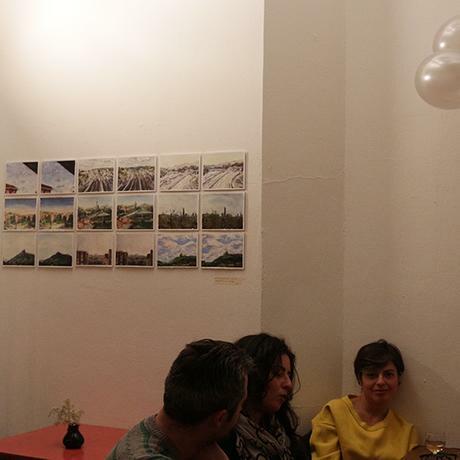 We also played radio Citté del Capo in the upstairs cafeteria space during the exhibition. Radio Citté del Capo was started in the 1980’s and named after Cape Town in solidarity with anti-apartheid sentiments. After a radio interview with them to advertise my workshop they agreed to broadcast from a playlist of South African music I had compiled for them during my exhibition event.